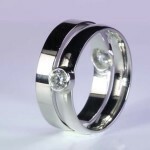 Two very fine quality Diamonds set in Platinum customised with a flat Band for Men and court band for Ladies. These exquisite rings can be used as wedding rings and also for raising a weak Venus by wearing them in the right hand’s middle finger and left hand’s middle finger. If the native’s Venus is weak, combust, in-active then these rings are especially powerful. For natives with lagana Taurus & Libra this Ring becomes a life ring for enhancing or achieving health, stability, defence from any crisis, vision, imagination, creativity, health, happiness, romantic life, relationship, companionship and rising. Additionally these Rings are also very important for signs with Lagna Capricorn & Aquarius for achieving or enhancing creativity, wisdom, decision & choices making strategy, education, birth of a child, name, fame, establishment, rise in luck, prosperity, achievements, rewards, profession, career, status, prestige, honour, peace of mind, property, family happiness & lifestyles.